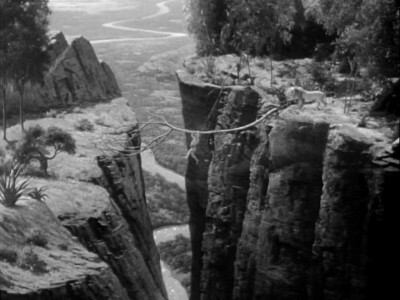 A white expedition enters the Great Escarpment and learns from Boy (John Sheffield) of the gold nuggets found at the bottom of a river near Tarzan’s family compound. The white hunters, Vandermeer (Philip Dorn) and Medford (Tom Conway) hold Jane (Maureen O’Sullivan) and Boy hostage, to make certain that Tarzan will take them to the gold. Well, this is my least favorite of all the MGM Tarzan movies. 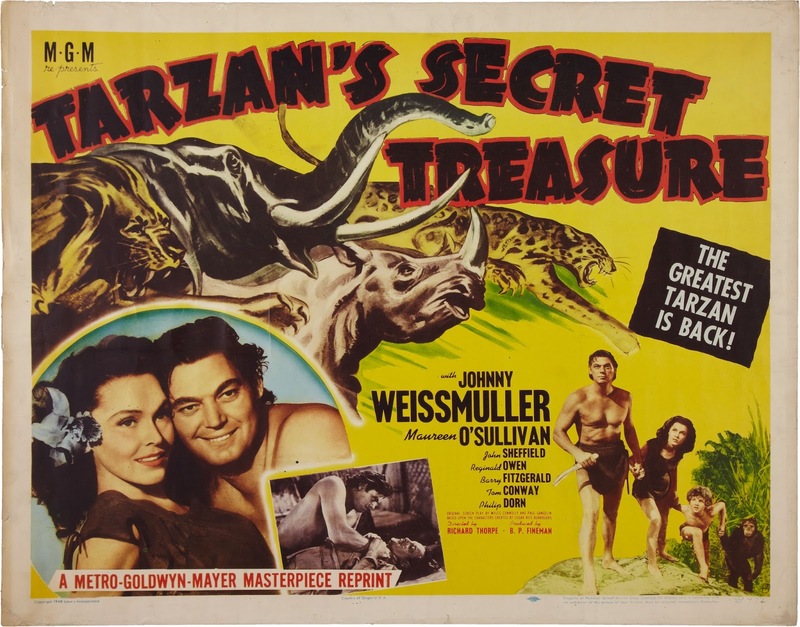 Tarzan’s Secret Treasure adds almost nothing new to the film series, and recycles key stock footage scenes from earlier entries. These include the underwater battle with the crocodile, and the rhino attack on the plains. Even Tarzan’s family dynamics, with Jane and Boy don’t go in any interesting or fresh directions. Basically, the plot here is that avaricious white men come to the Escarpment and, via their greed and guns, endanger Tarzan’s family. That has been, roughly, the plot of every movie since Tarzan and His Mate (1934). The gold nuggets in the river are the only new wrinkle. And honestly, those gold nuggets are put to better use in the last MGM Tarzan film, set in New York. Even the film’s comic-relief character, Mr. O’Doule (Barry Fitzgerald) plays like an inferior version of Mr. Rawlins (Herbert Mundin) from Tarzan Escapes (1936). Johnny Weismuller was always fit and impressive as Tarzan, but he is much wider and bigger here than in his previous outings. It’s not that he’s flabby – he’s not. It’s that he simply no longer possesses the right body type to be a believable Tarzan. He simply doesn’t look lean. I guess married life and fatherhood agrees too much with Tarzan. This is a shorter review than most I write here because there’s simply not much to talk about. Tarzan’s Secret Treasure is a clunky, familiar, tired movie. Nothing new or fresh happens, and the franchise doesn’t find any fertile new ground. This is the most forgettable and tired of all the Weismuller/O’Sullivan Tarzan entries. Fortunately the last film in the series is much better. I'll review it here tomorrow! I actually found this one a bit more enjoyable than "Escapes". I think there was a new dynamic in this, and this is the first time Boy and Tarzan don't see eye to eye on something. I like that Boy takes an interest in science and why thing are the way they are. This is in contrast to Tarzan's more conservative of just accepting things as they are. Boy's curiosity feels right and creates a natural conflict. I admit the movie could have done more with it, but I think it was an interesting script angle. I also like the boat battle at the end. 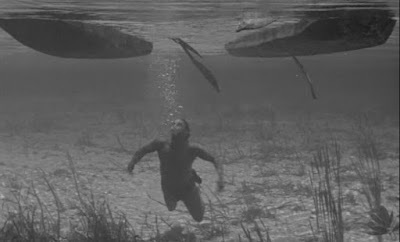 It got to show off Weissmuller's swimming skills and was a different finale than we had seen in the past. I also got a kick out hearing Tarzan say "Nugget". Middle of the road and certainly not an essential adventure, but more entertaining in my book than the sluggish "Escapes".